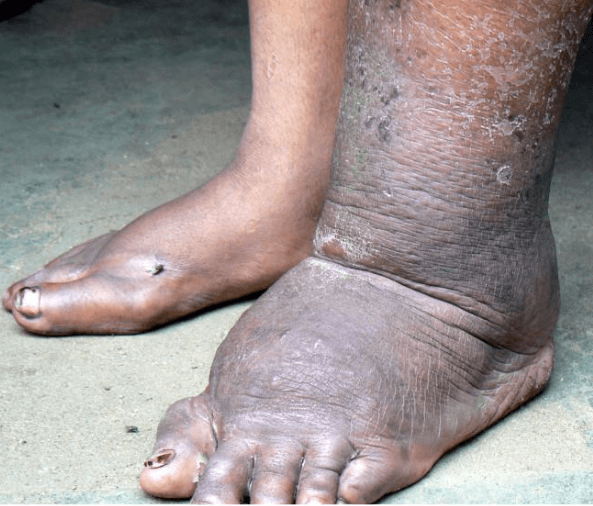 Lymphatic filariasis (LF) is a debilitating tropical disease that affects 70+ million people and is the second leading cause of disability worldwide. LF is caused by filarial (thread-like) parasitic worms that are transmitted by mosquitos. The adult worms live in the lymphatic system and cause chronic swelling in the legs and groin. LF is sometimes called elephantiasis because the progressive nature of the disease can disfigure the leg so severely it resembles that of an elephant. LF often brings economic hardship and social stigma to those affected. Monitor to verify that disease transmission does not recur. GPELF is the largest drug-based elimination program ever attempted, and a rapid diagnostic test is an essential tool for its success. When GPELF began in 2000, there were 1.5 billion people at-risk for infection. Since then, the program has distributed over 7 billion doses of medications and cut the population at-risk for infection nearly in half. However, LF elimination has lagged in Africa, due in part to a related parasitic infection called loiasis. Loiasis is caused by another filarial parasite, Loa loa (also known as the African eye worm), which is transmitted by biting flies. The disease affects 10 million people across eleven African countries and is a lower public health priority than LF. Loiasis itself is primarily considered a nuisance; symptoms of loiasis include transient skin swellings or an uncomfortable sensation when adult worms, which are about an inch long, migrate across the surface of the eye. While these symptoms are troublesome enough, loiasis can cause more serious problems in the context of LF treatment programs. This is because people with loiasis, especially those with heavy infections, can develop serious neurological side effects when they receive some of the medications used to block LF transmission. To complicate matters further, the diagnostic tests that public health programs use to determine where LF treatment is needed can be falsely positive in people with loiasis, especially those with high parasite loads. Thus, the prevalence of LF has likely been overestimation in loiasis-endemic countries, which is costly to elimination programs and puts people at risk unnecessarily. Our lab’s goal is to improve the diagnostic tests for LF and loiasis. The current rapid diagnostic test for LF uses the same technology as a pregnancy test, except instead of detecting a pregnancy hormone in urine, it detects a specific LF antigen in blood. The test requires only a few drops of blood and takes 10 minutes to complete, making it ideal for remote locations. In LF, the antigen this test detects is known as the circulating filarial antigen (CFA), and it is nearly always present in the blood of infected individuals. We wanted to know what antigen, or antigens, were causing false positive test results in people with loiasis. The presence of cross-reactive antigens in loiasis is transient. Unlike LF, where the CFA is invariably present, the cross-reactive loiasis proteins appear to be short-lived. In individuals with loiasis and false-positive LF tests, we found many different loiasis proteins, all of which were different than the LF CFA. Thus, in the laboratory, we can differentiate blood signatures from LF and loiasis. Our work has uncovered key differences in what the rapid diagnostic test detects in LF versus loiasis. Moving forward, we will investigate what triggers cross-reactivity as well as the kinetics of clearance. Analysis of more cross-reactive samples may uncover a reliable biomarker of loiasis cross-reactivity that can be integrated into the diagnostic test. Being able to distinguish true LF infections from loiasis would help accelerate the elimination of LF in Africa, and help ensure that elephantiasis due to filarial infection becomes a thing of the past. Abbreviations: LF, lymphatic filariasis; GPELF, Global program to eliminate lymphatic filariasis; CFA, circulating filarial antigen. These findings are described in the article entitled Identification and characterization of Loa loa antigens responsible for cross-reactivity with rapid diagnostic tests for lymphatic filariasis, recently published in the journal PLOS Neglected Tropical Diseases. 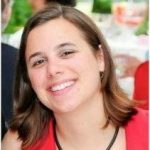 Marla Hertz is a Postdoctoral Fellow at Washington University in St. Louis studying the molecular biology of filarial parasites and probing the interaction between filarial glycoproteins and their binding partners to develop novel diagnostic tools. Philip Budge is an Assistant Professor of Medicine at Washington University, Saint Louis. Dr. Budge’s research interest is in the global elimination and control of lymphatic filariasis (LF) and other neglected tropical diseases. His current work focuses on development of diagnostic tools for the detection of parasitic infections in the context of global public health programs.